This week's giveaway is Jerry L. Sumney's The Bible: An Introduction (Fortress, 2010). Here is the blurb. What is the Bible? How did it get to us? Why are translations so different? - And what might the Bible say to us today? From its very first pages, The Bible: An Introduction offers refreshingly clear answers to the most basic questions that first-time students and curious inquirers bring to the Bible. Without presuming either prior knowledge of the Bible or a particular attitude toward it, Jerry L. Sumney uses straightforward language to lead the reader on an exploration of the Bible's contents and the history of its writings, showing along the way how critical methods can help readers understand what they find in the Bible. Neither polemical nor apologetic, The Bible: An Introduction presents the biblical writings as the efforts of men and women in the past to understand their lives and their world in light of the ways they understood the divine. So if you are interested in a chance to win this book, put your name below and I will choose the winner sometime on Sunday, August 7th. Remember, once announced the winner has five days to claim the prize or it goes back on the shelf for another time. Where did the Romans get the wood for the siege of Masada? I am at a conference this week and don't have as much time to blog. But I did run across this story about study which investigates where the Romans got the wood for the siege of Masada. 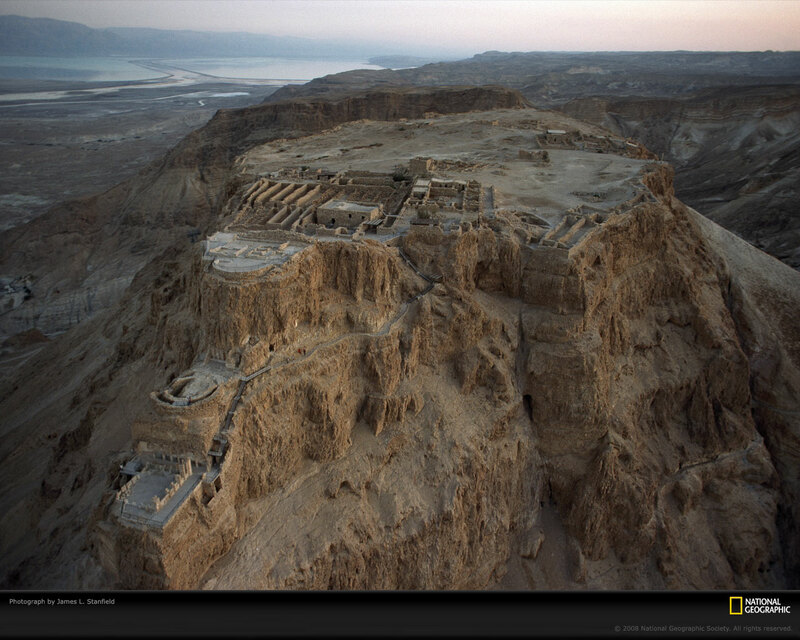 If you have been to Masada or even seen pictures you will know that there are no trees for miles around. There aren't a lot of trees in Israel and there are none around Masada. Some studies have suggested that the desert region around Masada was more humid at one time and thus supported the growth of trees. The below article, however, suggests that was not the case. Where did the timber for the Roman rampart at Masada come from? isotopic composition of the wood probably reflects a distant wood source. as more humid in the times of the Second Temple. You can read the rest of the article here. Although I am away there will still be a Friday book giveaway tomorrow. Be sure to check back. 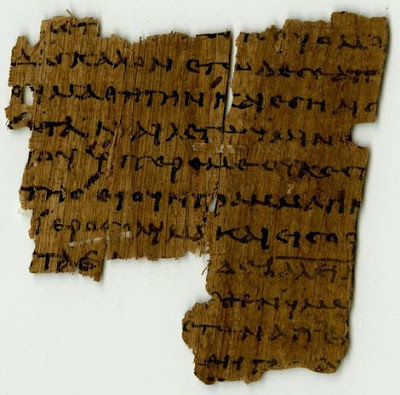 Last week I noted about Oxford University putting a papyrus fragments online in a bid to get people to help transcribe and measure the fragments. The article I linked to noted that one of the fragments contains an unknown story of Jesus performing an exorcism. It apparently dates from the 3rd century and is from and noncanonical gospel. 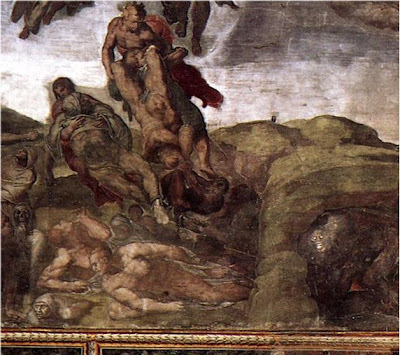 Larry Hurtado has also commented on it and provided a picture of the fragment. Here is a link where you can look at P5072. It will be interesting to hear what is said about this fragment over the next few months. I remember when I first began graduate level studies in Bible and theology. Even though I had grown up in the church, knew my Bible fairly well and an undergrad background in Bible and theology, I still felt like there were times when I was grasping in the dark. I remember sitting with a English dictionary to my left and theological dictionary to my right and a textbook in the center. It sometimes took me hours to get through a chapter of material. And then there were the writing assignments. What is the difference between an essay and a research paper? How do I review a book? What is the difference between a primary and secondary source? It was hard enough to wade through the lectures and the reading without having to figure everything else. And of course the internet was barely an entity for the public, so forget about Google! But I recently received an email from a friend who had co-authored a book that provides students with just the kind of information they need to be successful. Margot Northey, Bradford A. Anderson and Joel N. Lohr have released Making Sense in Religious Studies: A Student's Guide to Research and Writing. Here is how Joel Lohr explained it to me. In short, it's a guide to help undergraduate students find their way in the world of religious studies, theology, and university more generally. There are chapters on everything from writing essays, to book reviews, taking exams, giving presentations, documenting sources (and avoiding plagiarism), writing comparative and exegetical essays, short assignments, evaluating sources, learning languages, and so on. I was tired of answering questions like, What are you looking for in a book review? What is an exegetical paper? How should I prepare for the exam? What do you want in my presentation? What is a primary source, secondary source, good source? and so on. There is also a chapter on what Religious Studies is (and how it relates to theology in the university), as well as one on how to approach/succeed in university as a new student. I know of no other guide like it. This sounds like a very helpful volume. I will try to review a copy of it here once I get a copy for myself. Hopefully this resource will alleviate stress levels for both students and professors. You can order your copy now from Oxford University Press. Amazon will be releasing it on August 17. The topic of hell has been a hot one over the past few months (sorry, I couldn't resist that one). Rob Bell's book Love Wins set off a firestorm (sorry again) over the existence and nature of hell. Does hell exist? If so is hell forever? Or, do all the baddies just get annihilated? These questions helped to fan the flames of debate (sorry) and as a result the publishers presses have been running hot (sorry) with new books and articles examining hell. One such publisher is Christian History Magazine which has recently published a brief survey and guide on the History of Hell. This 32 page booklet can be read on line and is searchable. It provides an overview of the three traditional interpretations and covers Christian thought on the topic from the second century to the modern period. It also provides 8 pages of suggested resources for further reading. So if you are interested on how hell has been viewed throughout history click on the link to access the booklet. It promises to be a hot read (sorry, again). Congratulations to this week's book giveaway winner Annie Foerster! Annie please send me your details to jbyron@ashland.edu and will send you the book. If you didn't win this week check back next Friday for another chance to win another book.